Most public reactions to Jain’s claim have been met with derision and disbelief. But scientific evidence, including a major one by Australia’s CSIRO14, indicate that many of the chemicals given off by automotive dashboards, upholstery, wiring, adhesives and interior trim can offer the same consciousness-impairing and mind-altering effects as sniffing glue. The CSIRO study and others have found that — in addition to toluene, xylene, benzene and other Volatile Organic Counpounds (VOCs)(1-4) , there are phthalates (5-7), flame-retardants(11,12) and other Endocrine Disrupting Compounds that are outgassed from car interior materials and form the scummy film on windshields and windows.(5-7). Further, the CSIRO study noted conditions which suggest that it is altogether possible that Tesla driver Jain had been impaired, as he has stated, by the sedan’s new car smell. “Investigation into VOCs in new cars has been limited. Bauhof and Wensing (1999) described a standardised test procedure used in Germany in which VOC concentrations were measured at car interior temperatures of 23–65°C and an unspecified ventilation rate. “TVOC concentrations of 35,000–120,000 µg/m3 were reported for six new cars (test temperature not specified), these concentrations decreasing exponentially over a 40-day period to about 10,000–30,000 µg/m3. VOCs consisted of aromatics, glycol ethers and esters, aldehydes, ketones and amines. Click here for a chart of chemicals from Grabbs, et. al. Click here for a chart of chemicals from Faber, et. al. Undecane, the National Toxicological Program says, is an organic solvent and Central Nervous System depressant. Ethylbenzene, is classified by the EPA as the same sort of organic solvent with Central Nervous System effects. Used as a perfuming agent in cosmetics. As time allows, we’ll work our way through those lists above, and draw a few more connections and contextual touchpoints. Many of the compounds mentioned above have not been studied in enough detail to assess their human health effects. In addition, no studies have been located that assess the effects on humans of possible interactions among the various chemicals. 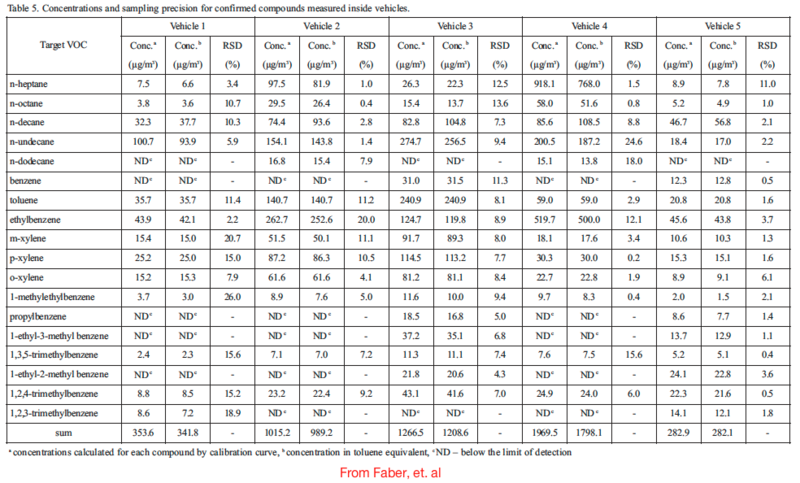 The windshield scum of phthalates and flame retardants will be examined in a future post. The footnotes in this post will also be re-arranged and cleaned up as time and the location of more original source documents allow. Tech Exec Jain’s case may turn on whether his attorney’s can establish that he was affected by the chemicals from his Tesla’s new car smell. Regardless, there are some cautions you should know about and actions you can take. According to Toshiaki Yoshida, chief researcher at the Osaka Prefectural Institute of Public Health, it takes more than three years for a vehicle’s inside air to drop to levels considered safe to breathe. The CSIRO study indicated a decrease of about 20% per week. But remember if amounts decreased by 20% the first week, then the second week would see a decrease from 80% to overall 64% the second week, then to 51% of the initial value the third, 41% the fourth and so forth. The tests done by Overton & Manura(1) indicated that the levels of interior pollutants decreased after two months, but that they remained temperature dependent. After your car has been sitting unused and closed even overnight, when possible roll down all the windows and drive for several minutes with the windows open. This is especially important in warm or hot weather. Drive as much as possible with the windows open. Avoid using your ventilation system’s recirculate functions except in heavy traffic where the outside air may be more unhealthy than that inside your car. Don’t use plastic upholstery, floor mat or other interior treatments, especially those with the “new car smell.” Make sure to tell your carwash you don’t want those. While you should not let your guard down, the levels inside your vehicle may be safest at the point when your windows no longer get scummed up from the chemical outgassing. (3) VOLATILE ORGANIC COMPOUNDS IN NEW AUTOMOBILES: SCREENING ASSESSMENT,By James S. Grabbs,1 Richard L. Corsi,2 and Vincent M. Torres3, J. Environ. Eng. 2000.126:974-977. (10) Am J Ind Med. 2008 Nov;51(11):803-11. doi: 10.1002/ajim.20592. Risk of leukemia and multiple myeloma associated with exposure to benzene and other organic solvents: evidence from the Italian Multicenter Case-control study. Costantini AS, Benvenuti A, Vineis P, Kriebel D, Tumino R, Ramazzotti V, Rodella S, Stagnaro E, Crosignani P, Amadori D, Mirabelli D, Sommani L, Belletti I, Troschel L, Romeo L, Miceli G, Tozzi GA, Mendico I, Maltoni SA, Miligi L. Risk of leukemia and multiple myeloma associated with exposure to benzene and other organic solvents: evidence from the Italian Multicenter Case-control study. Costantini AS, Benvenuti A, Vineis P, Kriebel D, Tumino R, Ramazzotti V, Rodella S, Stagnaro E, Crosignani P, Amadori D, Mirabelli D, Sommani L, Belletti I, Troschel L, Romeo L, Miceli G, Tozzi GA, Mendico I, Maltoni SA, Miligi L.
(13) Nagamura, Yusei; Satoh, Yuuichi; Tatsumi, Jun; Yamamura, Kunihiro. “Method for producing alcohols such as cyclohexanedimethanol” (European Patent Application EP1090902).